Floral Beaded Cross Stitch Kits are some of the most beautiful Cross Stitch Kits available on the market today. You can either purchase a kit that already includes beads, or you can choose your favorite floral cross stitch kit or pattern and add the beads. 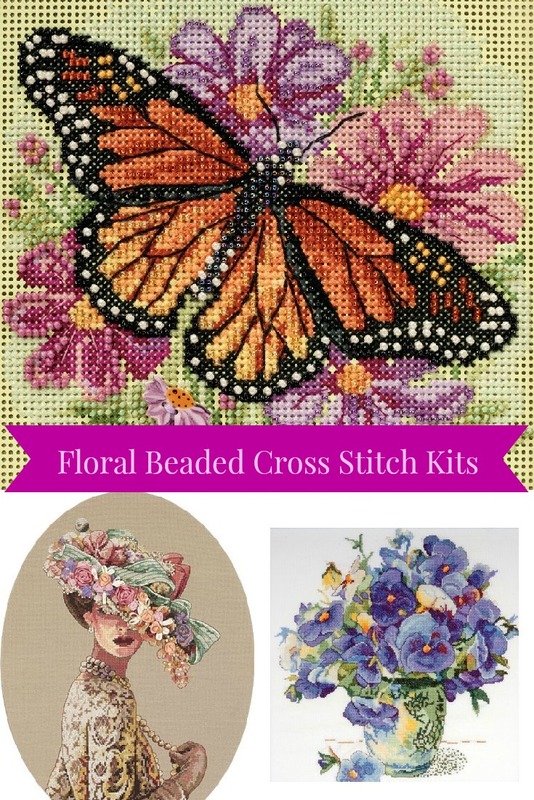 In this article, I will feature some of the gorgeous floral beaded cross stitch kits that already include everything needed. I am also including a tutorial here to show you how to add beads to a cross stitch project or kit that does not already include the beads. Adding beads to a Floral Cross Stitch picture turns an already stunning project into a spectacular work of art. I’ll show you everything you need to know to create a beaded cross stitch project and where you can purchase the supplies needed to create your own gorgeous beaded cross stitch design. 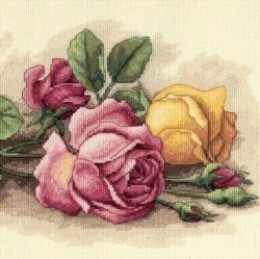 This page will focus on floral designs for cross stitch crafts. Once you learn the basics, you can extend those skills into heirloom quality projects you can be proud to display or to give as gifts. I have included a step by step cross stitch video and beaded cross stitch tutorial resources to help you along the way. Choosing a design is step one in your beaded cross stitch project. Make a list of the things you like. If this is a gift then make a list of the recipient’s favorite things. Consider what the finished project will be used for and where it will be displayed. Will it be framed, set on a table or hung on a wall? Will it be a home item (towels, pillows, etc) or will it be a personal item such as a purse, hair band, or handkerchief? When you have narrowed down the subject and the use of the project, then you can move on to the supplies you will need to create it. What design background do you need? What threads and beads will you need? If you purchase a kit that does not include beads, you can still add beads to the design. For instance, on the kit below, you could add a clear seed bead to each flowers stamen tip or iridescent seed beads on the angel wing tips to accent this beautiful picture. A precious little angel is picking passion flowers in this pastel colored, counted cross stitch design. Kit contains cotton thread, 14 count ivory Aida, thread sorter, needle, and easy instructions. You will need to add Beads and possible thread. You will need a design, aida cloth, thread, needle and seed beads to make any beaded cross stitch project. These are the essential supplies needed to create a lovely, unique cross stitch picture. You can use a variety of colored beads and threads or use the clear beads and clear thread (crystal clear — NOT WHITE). When you are using clear beads and threads you will want the most vivid background designs you can find and they should be free of any markings. That way the only thing that shows through are the colors. You can also use clear beads with colored threads. 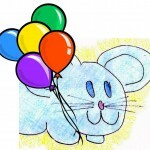 This will allow you to choose the colors to coordinate with your design. This is most recommended when the design is less vivid or has markings that need to be covered. Lastly: You can use colored beads and colored threads to create a depth of colors. If you are more advanced, you may find ways to incorporate these different techniques into a single project to create depth and get exactly the results you want to attain. Beading thread is not necessary if you are adding beads to your project as you are actually making it. Simply use the floss from the kit to add your beads. However, you will need a beading thread if you are adding beads to a finished project. White thread is not clear. Clear beading? Use Clear Thread. The count or fabric size refers to how many squares there are in the fabric per inch. 11-count means there are 11 squares per inch. 14-count means there are 14 squares per inch. 16-count means there are 16 squares per inch. 18-count means there are 18 squares per inch. Embellishing a simple cross stitch picture with beads is really very easy. Consider this cross stitch picture. I would add black seed beads for the eyes and the flower stamen tops. Or perhaps, add rose bead to their throats. Either of these little embellishments would truly add an awesome accent! Florals are always popular and it is very easy to add beading for detail to a flower. You can do a combination cross stitch and beaded cross stitch project as well. This technique will allow you to create a cross stitch project and add beading to selected parts of the design. There are few ways this can be approached. You could make a boarder around the design with beaded cross stitch and make the remaining area cross stitch without beads. You can do a beaded “item” on the over all design. So one item stands out from the rest. You could select a Black and White design and do all of the cross stitch in black and white except for one area you would do in color (such as a red rose or a pink ribbon). Use your imagination when you are considering a multiple technique project. Perhaps try your ideas on samplers before you move on to more time consuming projects. Highlighting a particular area may be all the embellishment desired. On this Romantic Floral Cross Stitch picture, I would use clear seed beads to highlight the candle flames for a very dramatic accent and a fabulous balance for the metallic gold thread included in the kit. Kit includes cotton thread, metallic thread, 14 count beige Aida, color-coded thread sorter, needle, and easy instructions. Everything needed is included in the kits below, including the beads. This kit is very easy and takes very little time to complete. Beaded Cross Stitch is Always Enchanting! One of my personal favorites is this Woodland Enchantress. She is part of the Dimensions Gold collection which I have found to be truly exquisite because of their masterful combination of color, beauty, and embellishments. Often they include metallic tread and/or beads with eye-catching placement to reflect the light or emphasis in a picture. Beware though, you will fall in love with these kits. Kit contains cotton thread, metallic thread, beads, 16 count dove grey Aida, thread sorter, and needle. This is such a beautiful picture, it would be a true delight to stitch and embellish. I can imagine adding a few clear beads on the leaves to replicate dew drops in the early morning. Stunning designs are one of the best strategies for creating amazing beaded cross stitch projects. There are hundreds of beautiful floral designs that are great because they are designer quality and have amazing colors and subjects. The main thing is to remember when you are looking for a beaded cross stitch kit, don’t limit yourself to kits that already include beads. You may need to add your own beads and upgrade the threads (if the kit is designed for cross stitch only, you can adapt it to use as a beaded cross stitch by buying beads and beading cross stitch grade thread). 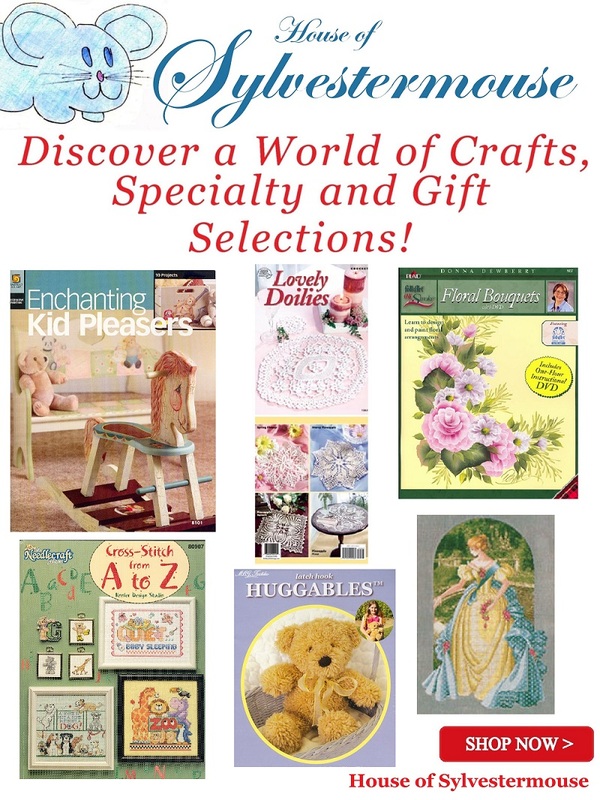 Search Amazon for Additional Floral Cross Stitch Kits to Select Your Favorite Here! Share These Floral Beaded Cross Stitch Kits and This Tutorial With Your Friends!